"Simple Strategies for Clutter Clearing Your Can Do Now"
Are You Overwhelmed with the Clutter of Life? for Achieving Calm and Focus. Welcome to my blog! Thanks for stopping by. I help busy people who want to be more successful, make better use of time and space and get organized for good! I post articles of inspiration and motivation to help all of us move forward with the life we imagine and deserve! 1. Tip Time: Folks, I took a break from writing the Quick Etips for Energized and Efficient People as I was working on several new projects and working with several new clients. Hoping this quick blog finds you enjoying the summer of 2018, wherever you may live. If you got away for a vacation or have one coming up, hoping you took or will take several deep breaths and enjoy the experience fully. Years ago many people took two-week (or longer) vacations. Nowadays it seems that shorter has become the standard. However long yours is (or was) relax, replenish and re-energize. No summer vacation for you this year? What can you do to put a bit of “vacation” in your daily schedule? Get out in nature and just focus on the animals and how they live in the present moment. Too hot outside for you? 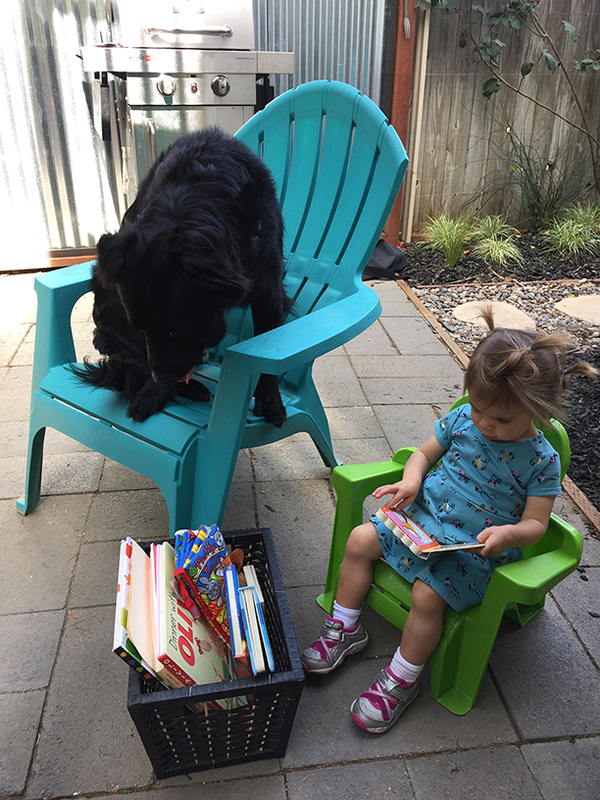 What ways can you keep your cool inside and consider time for indoor projects or summer reading? 2. Tip About Exploring the Outdoors: Several studies have pointed out that getting out in nature helps people be more confident and also improves one’s ability to interact with others. The “get out in nature” tip is not just my idea. Too hot? Can you get out early in the a.m. or in the early evening? 3. Tip About Summer Project Lists: At the start of summer I made a list of projects I planned to accomplish for summer, 2018. While some are making great headway and I am excited about finishing them up, I recognized my summer project list was too long, too unrealistic and nowhere was it going to give me the work/life balance I wanted for this particular summer. So here’s what I’ve done this week as I see August on the horizon - I’ve identified my Top 3 Projects for August and no more than three! The other projects I dreamed of getting underway and completing this summer, I have designated for September and October. Not going to beat myself up that they aren’t all getting done right now. Summer sails by too quickly - and some parts of it are made for sunsets, swimming, and silly stuff! 4. Tip About Compartmentalizing: Did you make a long summer project list, too? Or, instead of writing it down, has all of it been running around in your head, like what I call “clatter chatter” reminding you that you “should do this” or “should do that”? It’s what Dr. Wayne Dyer calls in an earlier book of his (“Your Erroneous Zones”), “shoulding” on yourself! 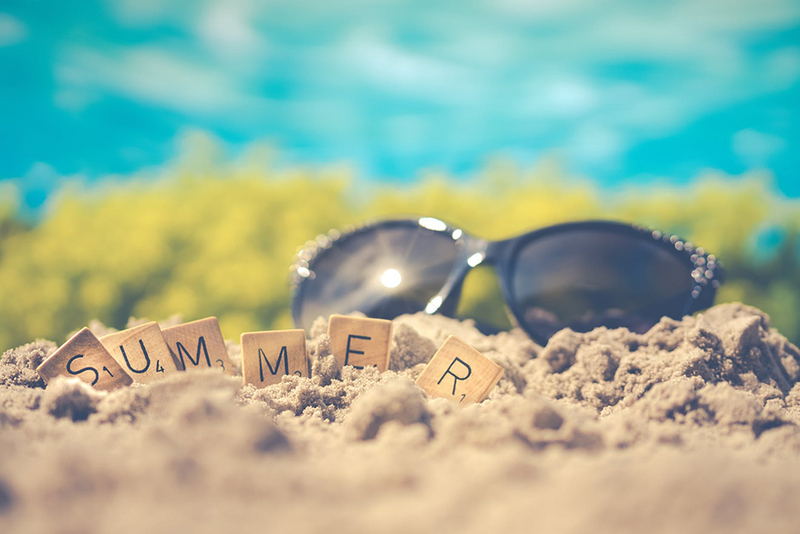 Time to stop that now and PICK ONE summer project for your focus - schedule time on your calendar when you will focus on it with time-blocking sessions of no more than 50 minutes. Take a 10 minute break and then go for another 50 minute time-block. Reward yourself and take time out for some summer reading. A book I’m enjoying this summer is by Dr. Joseph Murphy, “The Power of Your Subconscious Mind." Drop me a note and let me know what you’re reading this summer and the ONE Project you are tackling for August. I’ll be having a drawing for my new book from those who send me an email. Simply send it to sue@suecrum.com and put in the Subject Line: Below is the book I’m ready and my One Project for August! Ready or not - here comes August! "Be sure and catch my Facebook LIVE posts on Thursday each week for inspiration and motivation! I work with busy people who want to be more successful, make better use of time and space, and get organized for good. I am booking speaking presentations for 2018 and would love to speak to your organization, association or company. I love inspiring audiences to better productivity and focus. Please contact me at 760.803.2786 or Sue@SueCrum.com. 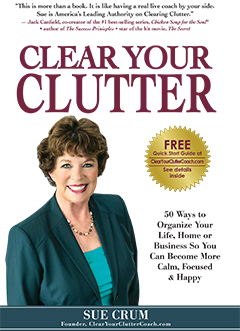 Autographed copies of Clear Your Clutter: 50 Ways to Organize Your Life, Home or Business So You Can Become More Calm, Focused & Happy are available here. Just $19.99, includes, shipping and handling. Click here to order. If you don't want a, autographed copy, or you'd lke the Kindle version, click here. FOCUS: The Power of the SPRING FLING! The Art of the Start - When Stumped with Where to Begin, Here’s a Great Place! and tips and news to help you stay organized, productive and successful.